“Yours and your family’s,” he replied politely. I took a drink from the tall tankard to give myself a chance to collect my wits, and something wonderful happened in my mouth: cool spring honey, clove, cardamom, cinnamon, pressed grape, burnt apple, sweet pear, and clear well water. That is all I have to say of metheglin. If you haven’t tried it, then I am sorry I cannot describe it properly. If you have, you don’t need me to remind you what it is like. ​This is Kvothe's taste of triumph following a well-deserved moment of success – something to relive and reimagine in the Waystone perhaps. I've used all (and only) the ingredients he identifies in describing his first Metheglin. *I used a Braeburn apple which weighed around 120g whole; 75g after being peeled, cored and diced. Lay the pears down on their sides in a small saucepan. Fill with enough boiling water to reach halfway up the side of each reclining pear (in my small pan, this was 300 ml). Add the cinnamon stick and honey to the small pan (using more or less honey depending on the relative amount of water) and bring the water back to the boil. Once boiling, reduce the heat to a simmer and cover with a lid. Poach for 25 minutes, turning the pears once halfway through. Meanwhile, make the sauce in another pan. Put all the sauce ingredients together and cook on a medium heat until the mixture is wet from the grape juice and the diced apple has softened (around 5 minutes). Blend in a blender until the sauce runs smooth. Divide the sauce between two dishes. Pop an upright pear on top. Optional: Serve with ice cream or Greek yoghurt. 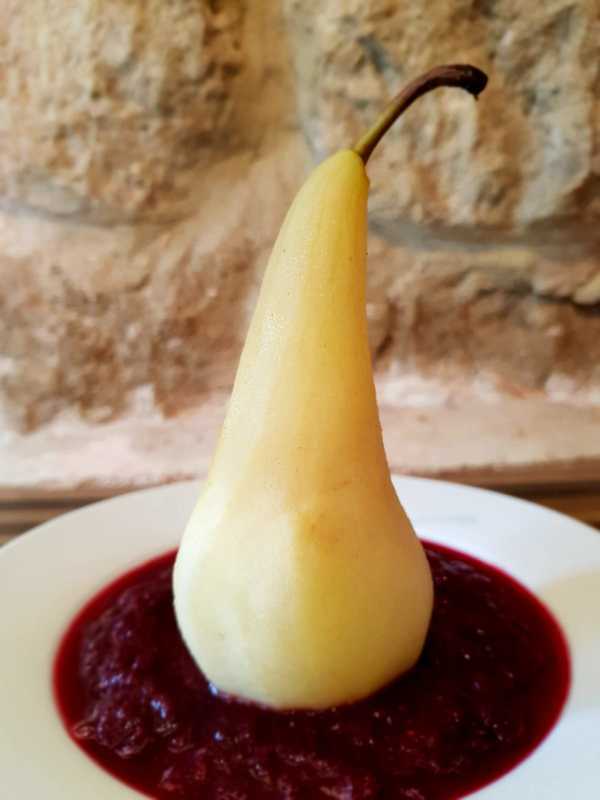 Alternative: Blend the pears with the rest of the sauce, strain through a sieve, mix with desired amount of preferred alcohol and a bit of clear well water. Drink.